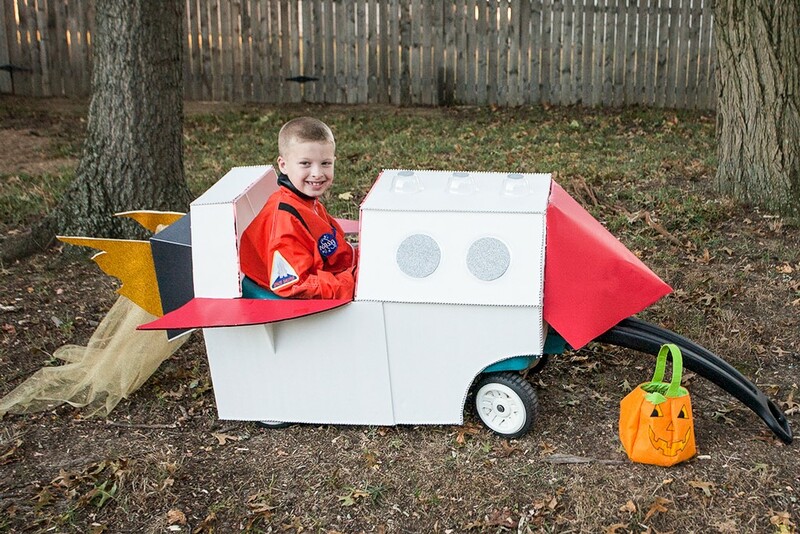 Here is one way to make sure your young astronaut has a Halloween that is out of this world! 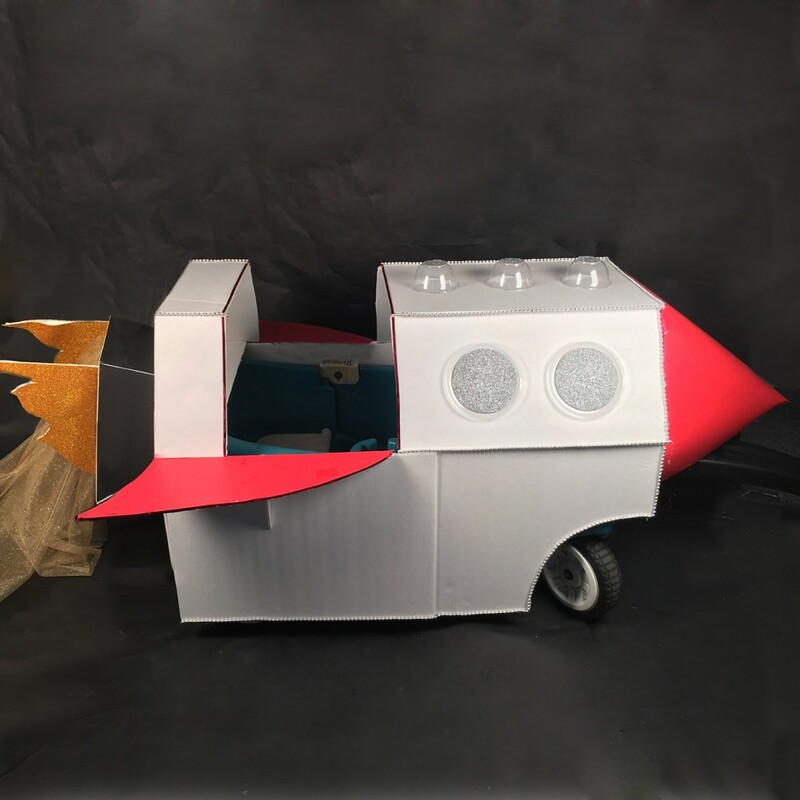 Make this DIY wagon spaceship and prepare to launch the trick-or-treaters in your house from stop to stop as they gather candy from all the “planets” in your neighborhood. 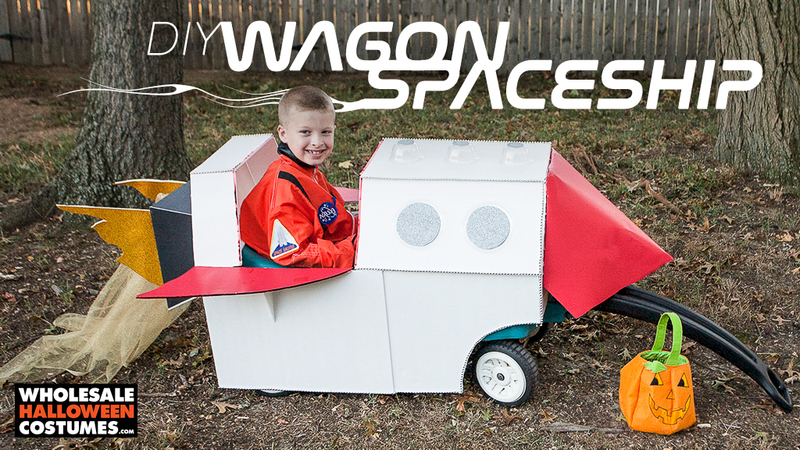 Even if your mission is to win at the Halloween parade, this wagon will definitely send the judges right into orbit! This project was designed to fit a “step 2” wagon. Measurements are included in the photos. You can modify the measurements of the pieces to fit whatever wagon you might be using. Foam core and poster board are from the dollar store; it’s more economical when using a large quantity. No astronauts in your house this year? 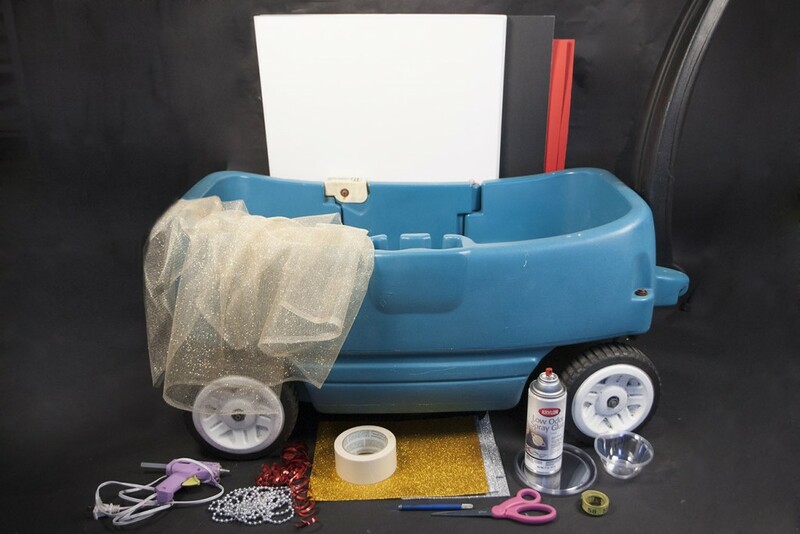 We also created tutorials for a DIY wagon princess carriage and pirate ship. Step 1. Cut pieces of cardboard to make the general body panels of the rocketship. I notched out a section on each piece to allow for the front wheels of the wagon to move freely. Step 2. To put the body together, I cut cross pieces for the front and back of the wagon. I made each piece approximately 22” across, wide enough to easily, so that the assembled body can easily fit over the wagon. I made one piece skinnier, to allow room for the “cockpit”. Step 3. Cut one piece of foam core, using the measurements indicated. Step 4. Glue the piece to the front of the rocket ship. Step 5. Cut two pieces of foam core, using the measurements indicated. Step 6. Glue the pieces to either side of the wagon, connecting each piece to the side and front of the rocket ship. This will create the tapered shape of the rocket ship. Step 7. Cut a top piece of foam core, using the measurements indicated. Step 8. Attach the top piece to the rocket ship. Step 9. Cut one piece of foam core, using the measurements indicated. Step 10. Cut two more pieces, using the measurements indicated. Step 11. Cut one piece of foam core, using the measurements indicated. Step 12. Attach all the pieces to the back of the rocket ship, as shown. Step 13. Cut two fins out of white foam core,. Cut a matching set of fins from the red poster board. Use the spray adhesive to attach the red poster board to the foam core fins. Step 14. Cut two small right angle triangles out of foam core. Step 15. Attach the fins to the rocket, lining them up with the cockpit opening and the back of the rocket ship. Hot glue a triangle under each fin for added support. Step 16. To make the engine, cut out 4 trapezoids from the black foam core. Step 17. Glue the sides of the trapezoid together, as shown. Step 18. Attach the engine to the back of the rocket ship. Step 19. Glue shiny red curling ribbon all along the edges of each fin, where the white foam core is exposed. Step 20. 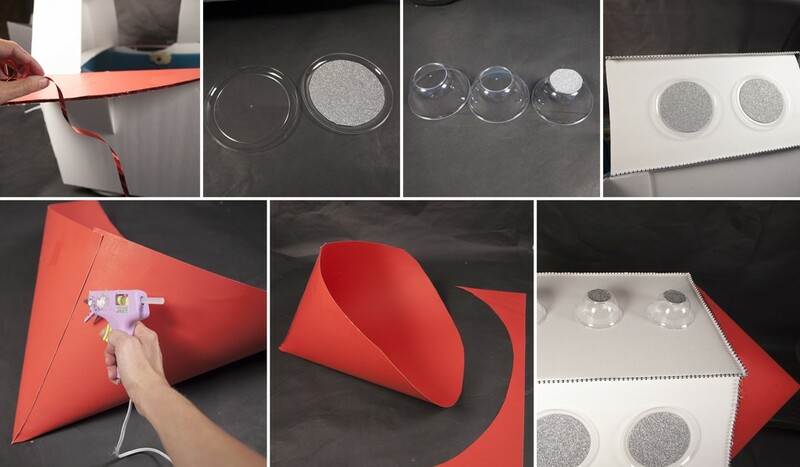 To make the windows, cut circles out of the silver glitter foam, large enough to fit in the center of each of the 4 clear plastic plates, while leaving some of the clear rim showing. Step 21. Cut small circles out of the silver glitter foam to fit on the bottom of the 3 small plastic bowls. Step 22. Attach 2 windows to each side of the rocket ship. Cut and hot glue strips of the silver Mardi Gras necklaces around the edges of the rocket ship, covering any of the messy areas where the foam core pieces come together. Step 23. For the nose piece, fold the red poster board together to make a large cone. Hot glue the seam to secure. Step 24. Trim off the excess poster board, to create a more unified cone. Step 25. Attach the nose to the front of the rocket ship, with the seam facing down. Attaching the nose is a little tricky. I folded over some of the poster board and flattened the edges to make it easier to glue. After the poster board was glued down, I cut out some of the underside of the nose, so that I could lift the wagon handle a little higher for pulling. Glue the 3 small bowls to the top of the wagon. Step 26. Attach the gold glitter foam to both sides of a piece of foam core. Cut the foam core in half to create a flame pattern, as shown. Repeat with the remaining 2 sheets of gold glitter foam. Step 27. Glue the glitter foam flames so they are shooting out of the sides of the engine. Step 28. Open up the gold fabric, and loosely fold it in half. Tape across the middle of the fold, and attach it to the inside of the engine, to resemble a long trail of flames. Step 29. The rocket ship is ready to shoot for the stars!! Your child will arrive at their party in style. So if you will be taking your Trick-or-Treating to an intergalactic level this Hallloween, share your pics with us on Facebook, Twitter or Instagram using #WHCostumes! © 2019 Wholesale Halloween Costumes Blog.